Woodland Animations Ltd licensed hundreds of Postman Pat products in the 1980’s and 90’s. One such was the Postman Pat Bubble Bath figure. The head came off to reveal a screw top. 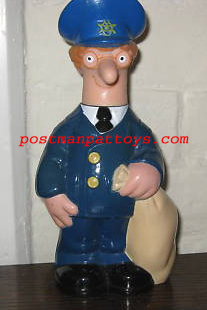 This Postman Pat figure featured Postman Pat with the ginger head of hair first seen in the original book illustrations. He has his glasses, blue peaked cap and mailsack. This Postman Pat Bubble Bath figure stands 9″ high and is marked ‘1990 Woodland Animations Ltd’. The bubble bath Postman Pat figure was made in England by Rosedew Ltd. It was originally sold with a printed tag on a string around the neck.